Would you like to work with children or young people? There is always a demand for high quality care professionals and our courses can help you get the skills and qualifications you need to start your career in childcare. Our qualifications are tailored to meet the needs of employment as well as progression to higher education. We have a range of childcare training courses, from level 1 up to childcare level 3 courses, to foundation degree courses and childcare apprenticeships. 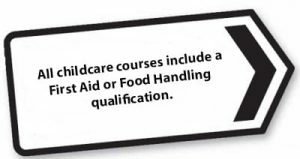 If you want to work in an early years or school environment then our childcare courses could help you on your way. You will learn theory combined with the practical skills needed to work with children and young people. Work placements are essential components of all the courses, giving you real life experiences of being in the workplace and finding out what it is like to go into a job in the field of childcare. Staff have had experience of working in childcare and will share with you their knowledge. They can also give you practical tips and advice both to help you while you are in college and on placement. Students have progressed on to great jobs in local nurseries, schools and childcare settings as well as further afield as children’s holiday representatives.